What does a terrific tote bag have to do with Passover? One word. Today, most women I know are hypermobile for work and life all the time, including during Passover. During Passover, I need a bag to carry my normal life stuff plus all my “Passover food”. Most women today schlep kosher-for-Passover food for themselves and their family. My Passover food includes quinoa-cranberry-mandarin salad and for dessert a container of Tapioca rum raisin pudding. That is a photo of me in Tokyo during Passover in 2016 holding my box of Manischewitz tam tam crackers on a pedestrian highway bridge. I carried this box of snack crackers around in my bag for 7 days and it was….well awkward. I need a bag for Passover that will make my life a little bit easier. 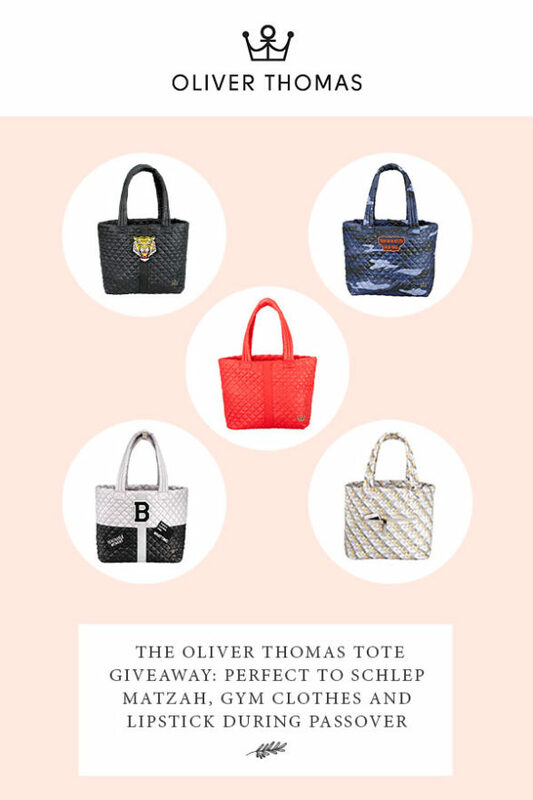 I found the perfect bag for Passover (and the rest of the year too): The Oliver Thomas wingwoman large tote. Oliver Thomas is on a mission to create joyful and functional and attractive bags for busy women. Their bags are super lightweight and have a special shoulder snap strap that keeps the bag in place (tell your Mom that the Head of Orthopedic Surgery at Mass. General even validated this bag as healthy for our back and shoulders). Their bags are durable, water resistant, and machine washable. The tote bag has a “My Secret Stash” pouch and additional compartments in every bag to keep us organized and to give us some privacy! The bag has an internal key clip so we will not lose our keys every other minute. To help us live better during Passover, Oliver Thomas is offering one lucky reader a free large Wingwoman Tote. Please note that to enter, you will need a USA shipping address. To enter, visit their site and post a comment below telling us which color tote you’d most like to wear this Passover. A winner will be picked at random on Thursday, March 16th. Thank you for supporting the purposeful brands that support Jewish Food Hero.